I don't know how it happened, but I ate at three fantastic Italian restaurants during my vacation in Las Vegas. Talk about indulgence! It just ended up that way. For our first night in Sin City, Lindsey, VB, and I had reservations at Todd English's OLiVES. Located in the Bellagio, it was really nice to walk through such a famous casino and dine in style. I also liked that their drink menu was on an iPad so you could pick a fancy drink! I had the Ricotta Ravioli, and it was delicious! Very good, and the menu had a ton of other options. The portion sizes weren't too much, and everything tasted really fresh. In addition, there were definitely affordable options like flatbreads that made this a very accessible restaurant for such a fancy location and offering. I would definitely eat there again, only this time try to get seating on the coveted patio overlooking the Bellagio's famous water fountain show. On my night out with AM and her friend JL, we went to the Paris casino for supper. We went to Le Provençal. Paris is another beautiful casino; there are parts of it that really remind me of France! The restaurant definitely skewed Italian, but the location was fantastic and the food was yummy! 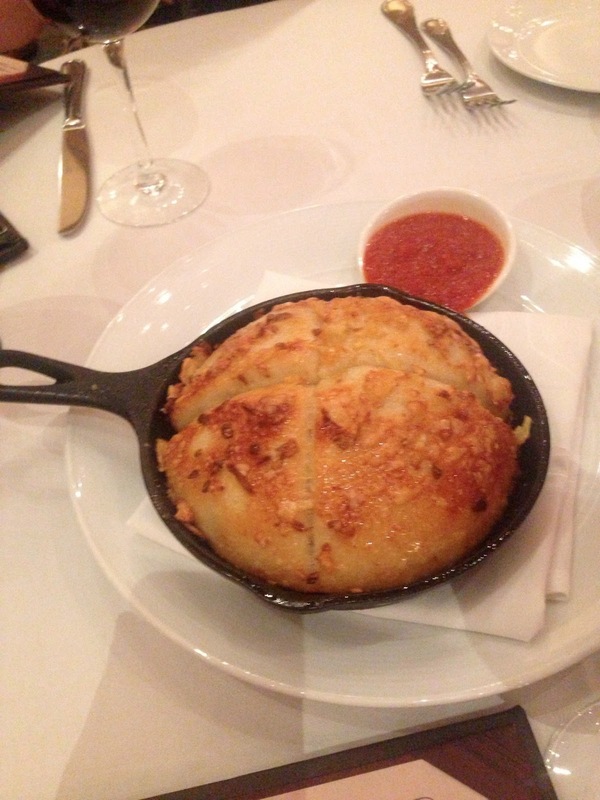 We started with the Brick Oven Garlic Bread, served in a cast iron skillet. OMG. That's all I have to say. As my dinner, I had the Rigatoni Bolognese, because I love that sauce. I was not disappointed! The portions were large, and I ate to the point of being stuffed. Good thing I was working out during the trip! 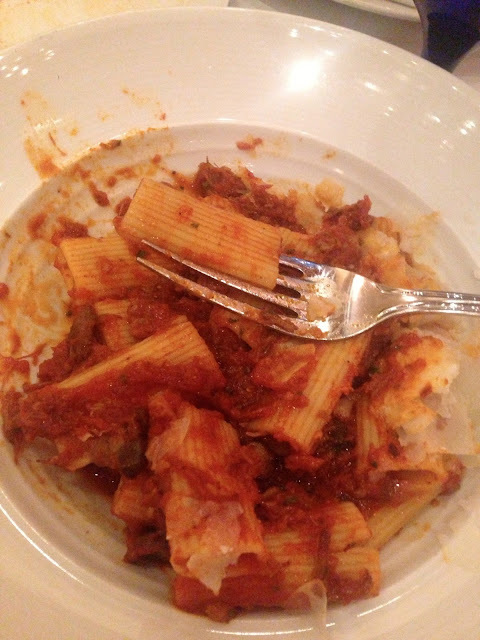 The last Las Vegas meal I will recount on this impromptu Tour of Italy was at our "home" resort, MGM Grand. 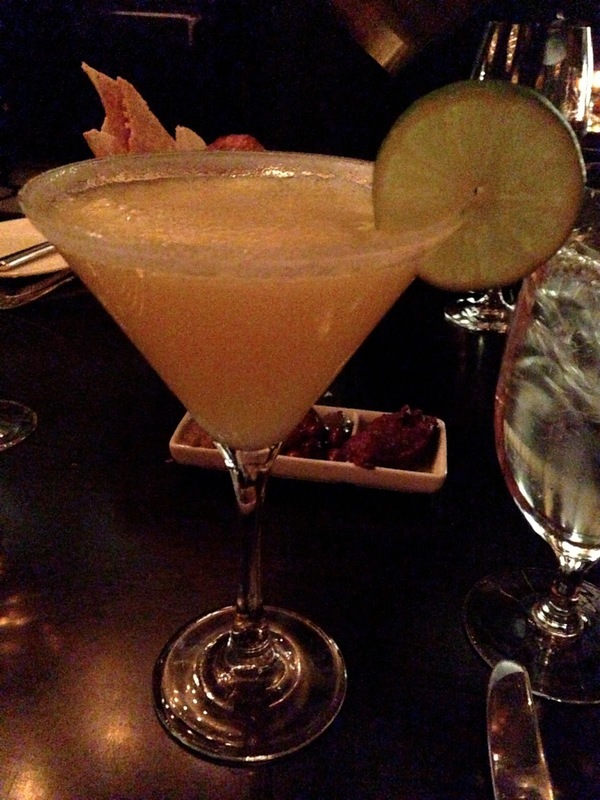 We wanted to stay close to the party that night, so we grabbed dinner at Fiamma. 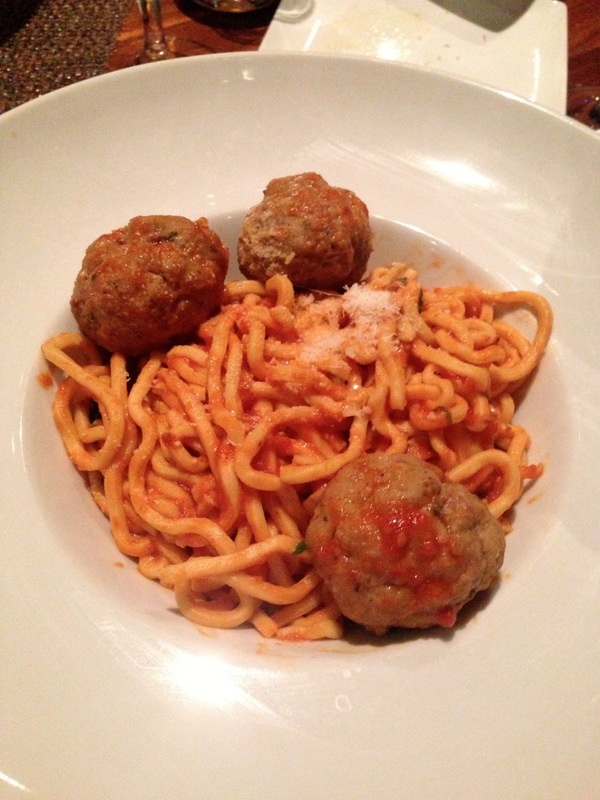 I think this one was my favorite Italian meal of the trip, because the noodles were housemade and fresh! All three of us ordered the spaghetti. We were hungry from the super workout in the morning, I think. And we all ordered individual carafes of wine, so this was probably the night I got most tipsy... in a fantastic way! Can't you tell that pasta is fresh? Soooo good. Oh, and did I mention we ALL ordered desserts? Lindsey had cheesecake, I had the apple tarte, and VB had gelato. And we finished it. ALL. Foodie comas all around. All in all, it was completely accidental that I ended up having Italian feasts three out of my four nights in Las Vegas. But the only one complaining is my waistline! Las Vegas may be known for shows and gambling, but the food scene cannot be beat. There are so any good meals to be had in Sin City! They should rename it Foodie City instead!